A determinedly eccentric old guy's journey while living a bicycle lifestyle. As I’ve been able to resume riding with more focus and intent it's has been pleasing to find things that help to enhance and improve the experience. There are three basic riding accessories with which I recent and new experience. I’ve been a user and non-user of helmets going back to the late 80s when I was riding the streets of Atlanta. I have always used a mirror, even (or especially) in the 80s in Atlanta. I have always worn glasses when riding. Since returning to more time in the saddle I have acquire a new helmet, glasses and mirror. Before I set-off on my adventure up the East Coast I made a hasty decision to replace my budget priced Bell with an even more budget Walmart helmet because I thought it would provide better ventilation, which it did. The helmet served me well, or I figure it would have if I’d fallen over, but it had weird one-side-only size adjustment and did not adjust large enough to wear a watch cap under in cold weather. I learned to make do. I don’t recall exactly how I came upon Kali Protectives, but when I read some reviews and then saw one for sale on eBay I bought it; Kali Protectives' Chakra Plus. It fits well, adjusts easily and abundantly, includes a bug net and seems to be more ventilated. There’s nothing more to be said. If you're in Gainesville you can get one through Bikes & More. When I began looking for a replacement mirror I considered Hubbub’s helmet mounted variety because the local bike club sells them with their logo affixed. At $20 they were much more expensive than my $8 Messenger Mirrors (no longer being made), but I liked the idea of having glasses free of encumbrances. I later discovered Mark Sheahan’s “Handmade Bicycle Helmet Mirrors” which are modeled after those made for decades by Chuck Harris, The Mirror Man, who died in 2012. Like Chuck Harris’ (and HubBub’s, I assume) the mirrors grip tenaciously to your helmet. Mark repurposes bicycle spokes to make the hanger, making them sturdy and highly resistant to vibration. After a couple of months of use I attest to their durability and stability. Fitting was modestly time consuming and not difficult, but it was more about wanting the best view than any difficulty with the device. I think that Mark has managed to carry-on the spirit of The Mirror Man, especially in the personal manner in which he dealt with me as a customer. A visit to his website, Harp & Spoke Cycling Products will show how highly customizable his mirrors are. One can make a statement as well as see what’s coming up from behind. An' like my "logo" better! Since 2011 I have worn a pair of Optic Nerve Photochromatic glasses and they have served me well. When Đại úy Chuck and I rode the GAP/C&O I wore a pair of mirrored, rainbow glasses that I really liked as an alternative. Unfortunately, the rubber nose pads came off too easily and disappeared before I could glue them in place, so I returned to my Optic Nerves. The Florida sun tends to be very bright year-round and there were many times when I did not feel the photochromatic glasses were dark enough, so I have always been watching for alternatives. I did not expect to find an adequate replacement for the Optic Nerves or the mirrored, rainbows, but I did . . . on eBay . . . surely too cheap to be good. I paid $20-something for two pair of glasses; one rainbow and one clear. I have always had a pair of adequate, clear safety glasses (with mirror) for night riding, so getting a potentially better replacement for those was good. After a couple of months of wear I have concluded that the cheap glasses are worth more than they cost. There is no visual distortion, something of which I am very aware after cataract and detached retina surgeries. They fit well and tightly. The ventilation holes do a good job of clearing fogging. They are light and their close-to-the- face fit does an excellent job of keeping out rain and debris. Both the mirrored and the clear lenses work well. The fit might be too tight for some people, but for me these are a winner. They are available on eBay from AppleBoogies . I never ride without sun or clear glasses. I, also, always wear a mirror. Both acessories seem like essential pieces of equipment rather than options. Having a helmet that fits well has made me face my invalid logic that riding helmetlessly is ok. It might be ok, but I accept that it's not a good idea. Eye protection and the ability to know what's behind are important and so, too, is having head portection. When I saw the Ford F150 in the Publix parking lot I had feelings ranging from disgust to humor. Should I put aside my sense of political correctness and accept that the driver simply has a macabre sense of humor or be dismayed because the driver might be one of the people who might have passed to close to me as I was riding? I concluded that the best way to dismiss the possible troglodyte behind the wheel of the monument of excess was to imagine the insurance rate he, she or (more likely) it faced for wretched driving habits. With a cup of Nicaragua Matagalpa from Flagship Coffee Roasters (defiantly filling a large Starbuck's cup), the ASUS tablet up and running it's a good time to make an attempt to catch up on several things. Because I'm typing this text using the ASUS MeMO I'll update its years-worth of usefulness. After a lot of research I purchased the MeMO as a replacement for an aging and failing MSI Netbook. Its primary use is as a portable word processor and sometimes internet surfer and it does both these things adequately after adding a bluetooth keyboard (Anker Model A7726) and finding an application (TextMaker) that mated well with Word 2000. The single nagging problem with the ASUS is the abundance of bloatware the manufacturer puts on the machine. It is more an irritant than a problem except when multiple downloads occur. In general the MeMO is a satisfactory replacement for the Netbook; more transportable, quicker to start up and does what it was purchased to do. When my VDO bike "computer" ceased working I discovered the VDO C3 Wired Cycle Computer at model was no longer available except in a wireless model. I've never had good fortune with wireless computers and the wireless VDO I purchased as a replacement failed to function properly. I've no need for most of the data that modern bike computers can provide, but the VDO's "Navigator" function (which allows for independent tracking of intermediate distances) was extremely useful when touring. I could not find a similar function on any devices at a price I was willing to pay, until I discovered the SunDING SD-563B, a wired computer costing about $10. Not only does the SunDING have a count-up and count-down function for time and distance like the VDO's Navigator function, it is back-lighted, too. Unlike the VDO and many other computers, the relevant information I want to see most is always visible; time of day, current speed and distance traveled. Stopwatch, average and maximum speeds, count-up/count-down and even temperature are all available in one of the three modes accessed by pressing a single, centrally located button. The display is large enough be read with my aged eyes. I gave a SunDING to a friend who rode the 2016 RAGBRAI where it functioned so well that when someone cut the wire from the pickup he purchased two more; one as a replacement and the second as a back-up. The first of the SunDING computers I purchased functioned frustratingly, resetting for no apparent reasons at unpredictable times. Because of the success my friend had coupled with the low cost I was willing to take a chance on getting a second one. The replacement has worked properly for many months and miles. Like my friend, I also purchased a second one just in case! With the SunDING readily available on both Amazon and ebay at a range of prices from about $6 to $16 or $17, the purchase of two is not a budget burden. One additional consideration is to purchase from someone selling in the USA thereby avoiding the long wait typical of China Post where delivery can take twenty to thirty or more days. It's been more than a year since I upgraded to my current smartphone, the LG Stylo. The phone is oversized and fits the broad category of phablet, but is a good choice for my large and mildly arthritic hands. I was disappointed when I found a crack in the back plate of the phone and anticipated having difficulty finding a replacement. My worries were misplaced. On ebay I found an assortment of replacement back plates. I ordered one (Unbranded/Generic) priced at $1.99 and free shipping (by China Post) from forever-mall888, figuring it to be a minimal risk whether it fit or even arrived. When the back plate arrived after about a month, which was still within the anticipated delivery time, it not only fit, but was more than a back-plate. The vinyl-like material wraps around the edges of the phone providing some impact and scratch protection. All of the necessary cut-outs for USB, camera, speaker, et cetera, are where they need to be. After two months of use I see no evidence of undue wear which suggests that it might outlive the phone. Alachua County patched the numerous cracks on ABT where it parallels Haile Blvd. It has been suggested that problems with the clay base caused the problem. Perhaps the warranty from Hipp on their paving was limited to 90 days? The stretch of sidewalk passing in front of Kimble Wiles Elementary and Kanapaha Middle Schools is no more. As of Friday, August 12, the concrete gave way to dirt. Presumably the county plans to cover the dirt with asphalt but ran out of time before the first day of school. The story offered while ABT (Archer Braid Trail) was being extended through Kanapaha Park alleged that the school system had denied its permission to allow the Archer Connector to join with ABT; almost two years later it happened. Ordinary citizens can't expect to understand the reasoning that made this 0.4 mile stretch untouchable in 2014 . . . or something. Nonetheless, regular users will appreciated it when completed. Anyone who tours by bike or takes part in demanding rides over long distances understands the need for convenient food that can be consumed along the way. Whether devouring or savoring the ubiquitous "energy bar", the consumption alone instantly boosts mood if not energy, but the fuel does get to where it is needed, assuring a few more productive miles. A touring rider usually has opportunities to stop at fast food and convenience joints, even where routes meander around traffic heavy places. Of course, there's also fast food America in all but the most isolated places. Irrespective, the energy demands are such that regularly adding carbs is a necessity. I have relied on Lara Bars as my go-to fuel since discovering them in 2010 or 11. I've sampled and used others and have a box holding a large number of accumulated "energy bars." Friends and acquaintances often give me products and often they are wholly satisfactory. The accompanying image is a small sample. When Get A Whey bars appeared at Haile's Farmers' Market I bought some to support the Gainesville maker of the product. The bars are substantial at three ounces (eighty-five grams). Because they are whey based they have significant amounts of protein and you can make your own decision about how much of what kind of carbs is best or how many calories you want (260 for Banana and 250 for chocolate). Overall, Get A Whey compares favorably to most popular bars. If there is a questionable element it is sodium which reaches 220mg in the chocolate flavor. Non-scientific logic suggests that replacing sodium would be useful if you're sweating a lot. Ultimately, what matters most is whether the things are edible and both banana and chocolate that I have tried are tasty. 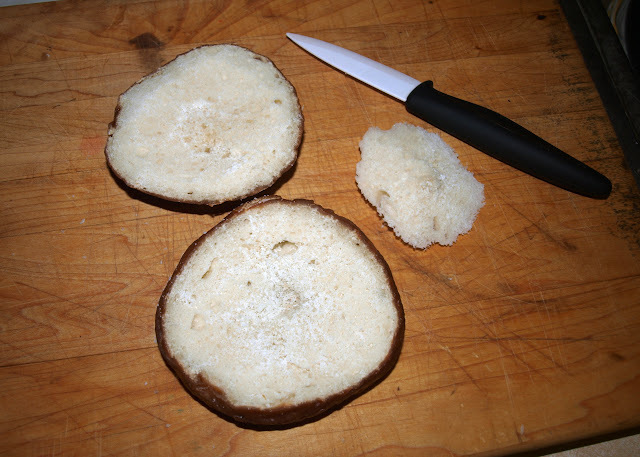 they might be too crumbly for some but that quality also makes them easy to use while moving and don't want or are unable to pay close attention; pretty much stuff, bite, chew, repeat. Additionally, their sweetness does not turn your fingers sticky. No one likes sticky handlebars. At $3.50 they might seem pricey compared to national name-brand products (they pack almost 30 grams of carbs) but they're made locally and are competitive in quality, so I will make sure to have some aboard on my next multi-hour ride. More information can be found on Get A Whey's facebook page or website and they can be purchased every Saturday at the Haile Village Farmers' Market. At my recent physical examination, courtesy of the Geriatric Section of Randall VA) I was advised to add supplemental calcium and Vitamin D to my diet. I checked the amount of each in the 50+ multiple vitamin I have taken for a few years. When I compared it to iconic One-a-Day'sÒ 65+ both were present in greater amounts. The cost appeared to be significantly less, also, and where vitamins are concerned cost is a primary consideration, but 150 tablets for slightly more than half the cost of 50 of the other brand seemed wrong. When the name of a product is "One-a-Day" its dosage should be obvious, but when I checked my aged-eyes couldn't find a definitive statement to "take one tablet with meals" or something similar. After hanging some readers on my nose and looking more closely . . . The pictures show the proper dosage. Usually, I'm not moved by the inequities of "ageism" but needing to put on reading glasses to find that the intuitive answer was the wrong answer took me aback. I say, "Large Print for Old Eyes!" 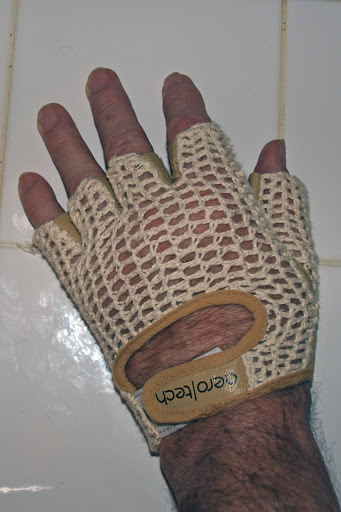 Call it Old School or throw-back, but I prefer crochet back cycling gloves with real leather palms. 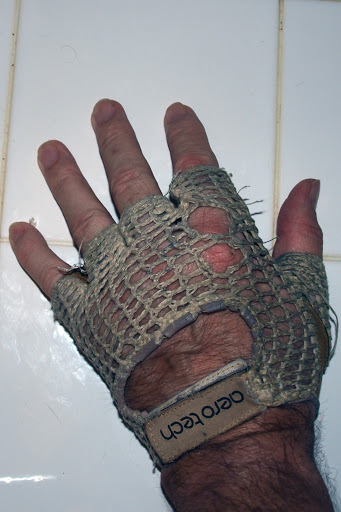 They are what I wore in the 80s and when I try more modern gloves I return to them. 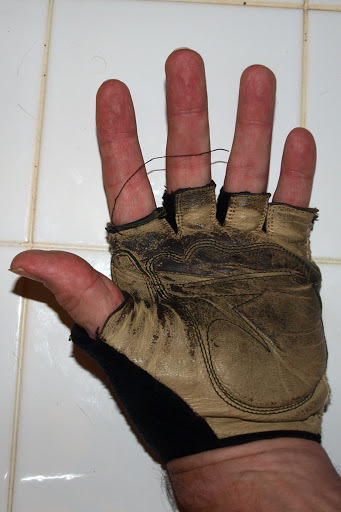 I usually have three to four pairs that I rotate conscientiously and seldom wear the same glove on successive days. 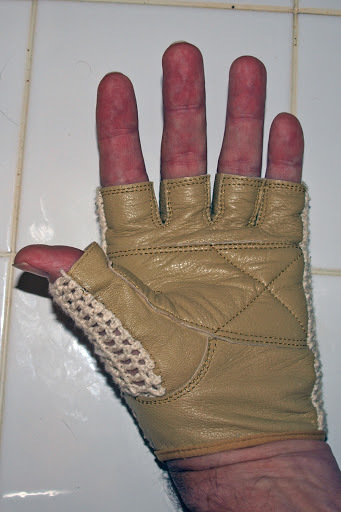 High quality gloves last about a year before the typical signs of break-down become excessive; fraying, seams parting and crocheting unraveling. 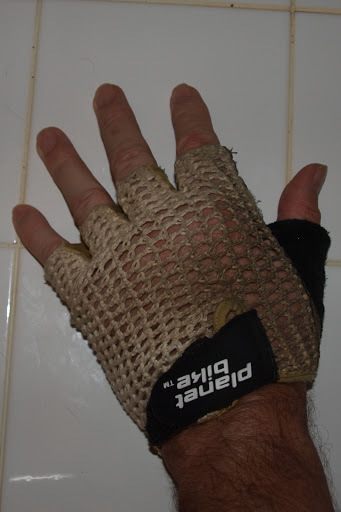 I have mostly purchase Nashbar gloves because they are the least expensive (less than $12 and frequently on sale) and they have always held-up well. Planet Bike’s similar offering are generally twice as much or more; upward of $20 in some bike shops and $15 or more online. I have enough experience with both brands to recommend either. When I had an issue with a pair of Planet Bike’s, I returned them, with an explanation, and received a replacement: a reflection of their good customer service. I have never had a similar failure with Nashbar’s. The third brand I wear regularly comes from Aero-Tech Designs. Unlike the other brands I have a very small sample. I bought a pair three years ago and until a few days ago that was my only pair. They had become ratty (at best) so, along with some other things I purchased a replacement pair through Amazon (less than $20). 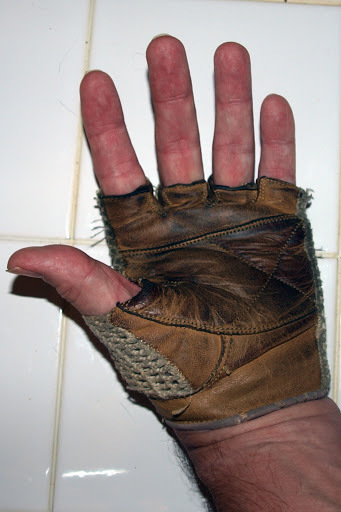 I was critical of the first pair of gloves because I thought the thumb hole was too large. In retrospect that was a pretty minor complaint because, now, years later, I prefer the fit of them over other brands. That I can still wear the original pair is pretty positive, too. Below are my new and the old Aero Techs. One thing you will see from the image is that I am not very concerned about the appearance of the gloves. Yes, I hand wash them occasionally and I hang them to dry, but I like the battered, road-weary look of them and don’t need a new pair if they get some bike crud on them. The old Aero Techs are beyond crud and will be retired. 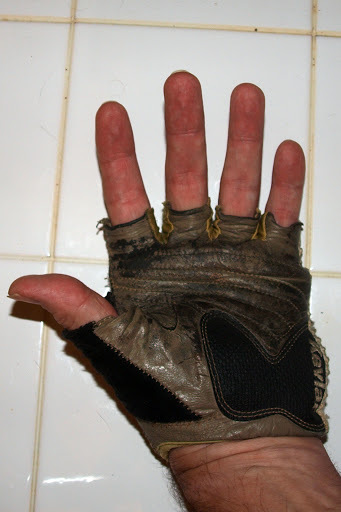 One caution about these gloves . 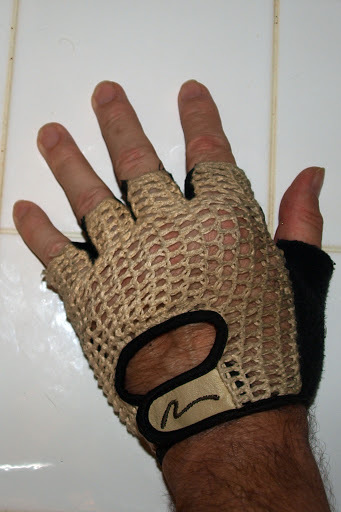 . . you will have a waffle pattern of tanning on your hands if you ride a lot and it occasionally attracts enough attention for people to comment. I always purchase size 9 and have never had a fit problem because they all stretch and shape themselves to my hands in a matter of a few rides. Been hearing and reading a lot of bicycle safety recently. Some observations and opinions follow. My personal safety is first and foremost my responsibility. In a close encounter of the physical kind with a motor vehicle, I lose. The Idaho Stop makes sense: Idaho Statutes, 49-720. Sometimes sidewalks are the best place to ride. If time matters a lot, don’t ride a bike to your destination. Should you be riding beyond walking home distance if you cannot take care of a flat tire? Should you be riding anywhere without the necessary items to repair a flat tire? You can dress for rain and you can dress for cold, but clothing does very little to make it easier to ride into the wind. No, I do not NEED a car. No, I do not want a ride, but if I need one I will ask. If you claim “Same Roads, Same Rights, Same Rules” then stop signs apply to you, too. As with many things in life, the best price does not guarantee the best service, so find a Friendly Neighborhood Bike Shop for parts and repairs. 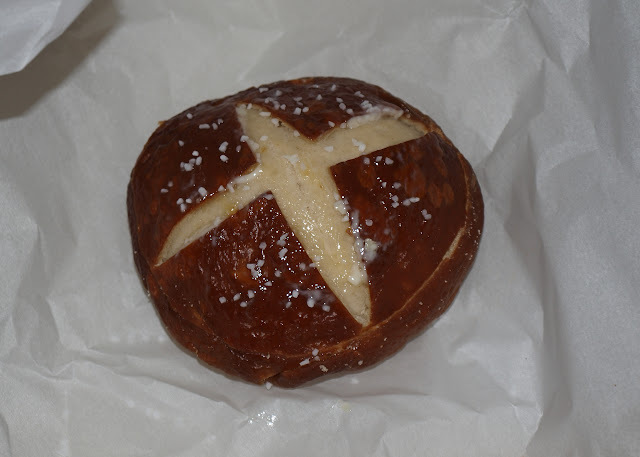 I like LEJ’s pretzels a lot and I generally buy one every Saturday Morning at Haile's Farmers' Market. Now, there’s one more thing to like . . . a lot. 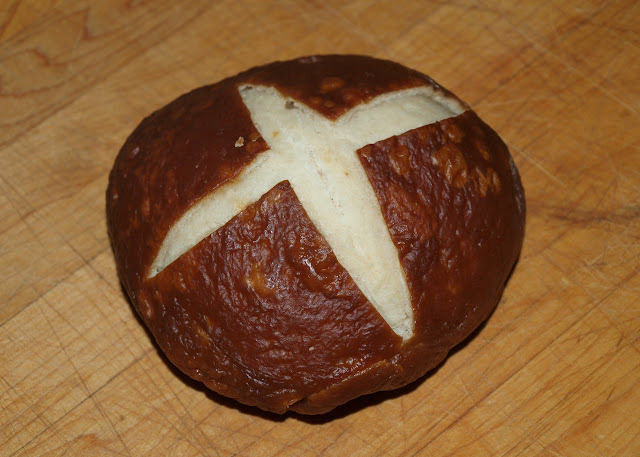 Their new addition is Pretzel Rolls—both round and long—that are not simply the device you use to get the sandwich filling to your mouth. LEJ’s pretzels are long on flavor and add their own flavor to something like one of Nana Pat’s mustards. 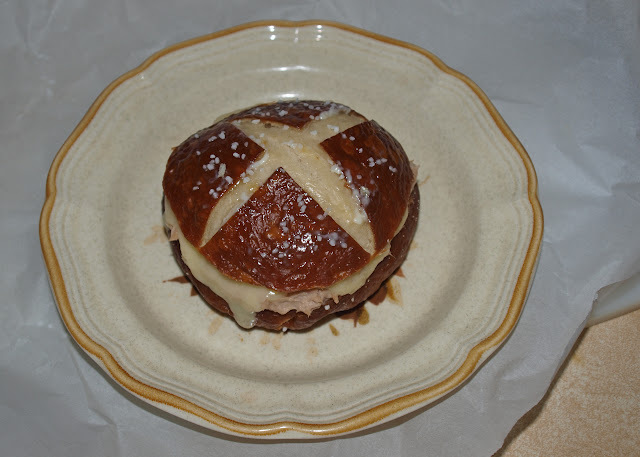 The rolls are no different; ham and cheese, Lebanon bologna, and pastrami each worked well. One roll remaining frm the bag of four. I could make burger, but that was too obvious. 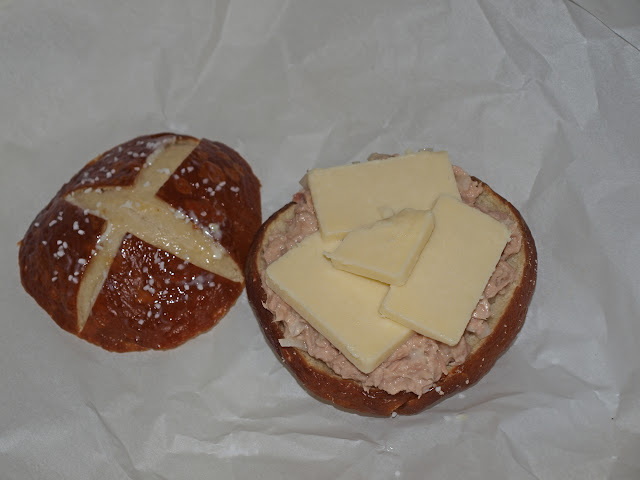 Instead, I opted for a tuna melt, a messy proposition with most rolls. It turned out to be a damn good sandwich. The rolls are probably not a part of an everyday sandwich. Grilling burgers and sausage? Yep. Ham and cheese and serious mustard? Yep. Tuna melt? Looked and tasted good. 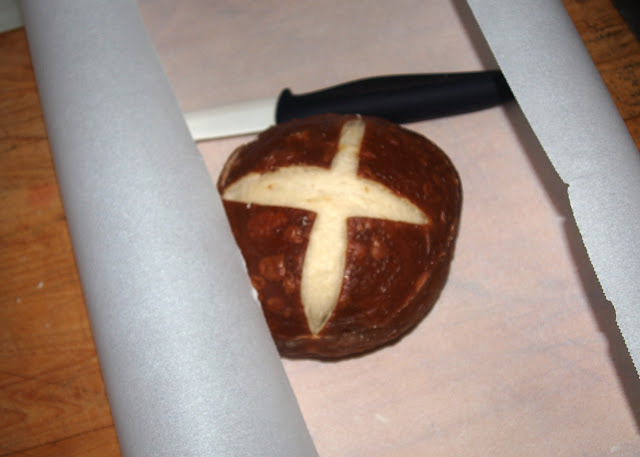 Wrapping in parchment paper proved to be best way to warm rolls. 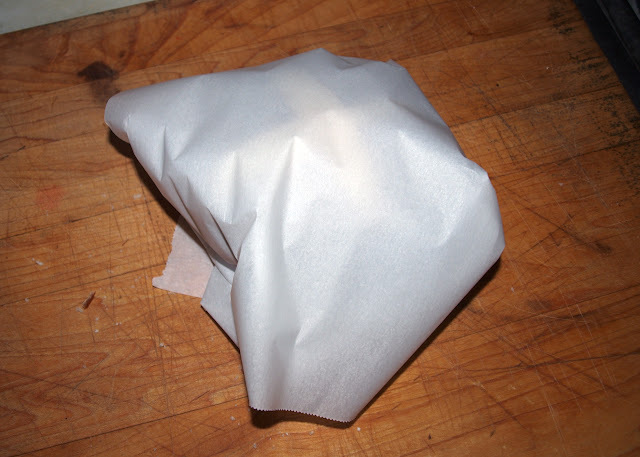 Wrap roll loosely, but completely. Warm in oven set at 170 degrees or so for about 10 minutes. Rub, paint, dab or spread butter on warm surface then sprinkle with coarse salt (provided). 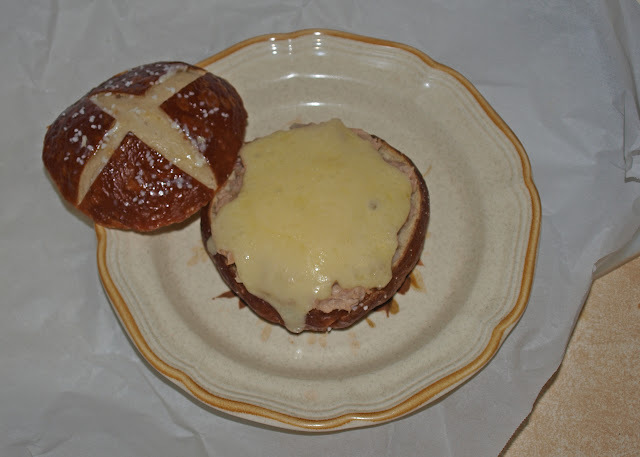 Add tuna and cheese then broil until cheese melts to preferred consistency.